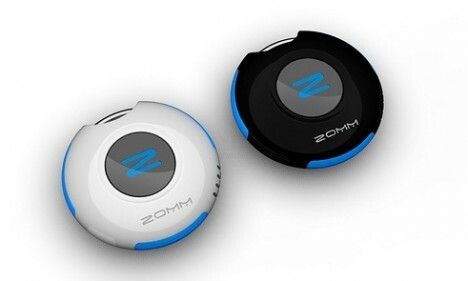 Absent minded people who always leave their phone behind somewhere when they are in a rush especially are given an option to minimize their losses by ZOMM, a Bluetooth wireless leash for mobile phones. Shaped a bit like a hockey puck or a poker chip, the tiny device can be easily hooked to a keychain or kept inside a handbag, purse or pocket. When users accidentally leave their mobile phone behind, ZOMM will trigger an alarm and alert users accordingly if users walk too far away. Besides being a reminder to prevent users from losing their phones, ZOMM also supports wireless speakerphone for incoming calls and features some personal security features for emergency use. Even when the mobile phone is out of sight from users, the small gadget still allows users to receive and answer calls via the built-in speakerphone. It will vibrate and signal with flash lights accordingly to notify users whenever there is an incoming call. Users can also send voice mail by pressing the multifunction button twice. ZOMM has included a panic alarm and emergency call ability in this device. The panic alarm will be useful particularly for kids to send out ear piercing alert to fend off a would-be attacker when they are at risk. A single press to the emergency call button will connect users to emergency personnel during an emergency or in the event their mobile phone is stuck or dropped into a drain, etc. The device is chargeable via a standard micro USB wall charger and it is connectable to any computer for updates and activation. ZOMM is developed with the intention to help forgetful people to keep their mobile phone secure especially those who have stored a lot of important and private stuff in their phone. Losing the phone can be a big problem to them. The security features are added functions to help users when they are in danger or an emergency. There are no details on the pricing but the rumored retail price is about US$79.